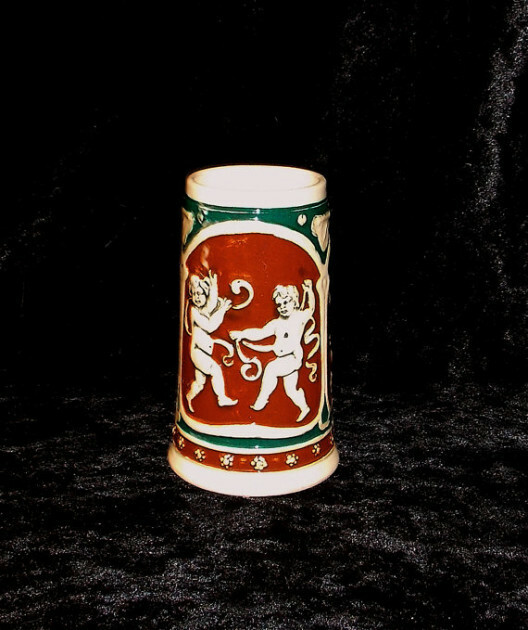 The depiction of Cherubum on this imbues a romantic quality about the stein. The motif and production quality indicate care for the artwork,and and the hand carved process while the clay is still wet. 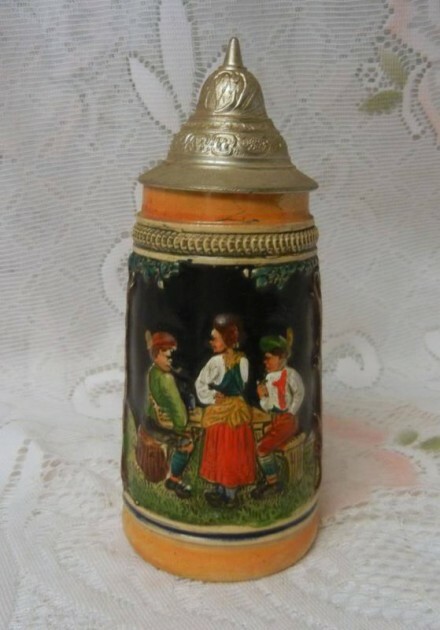 This is most likely a stein made in Western or Northern Germany. The artwork on this is amazing, as such work was carved into the pottey while it was still wet. Resembles many very famous steins by Mettlach,Villery and Boch (EDITOR’S NOTE: in your dreams maybe!) and a few other very collectible steins from North and West Germany, yet without the official marks. [what official marks ?? ?, what AB- Y !.] Or any others similar that I have found. Playful Cherubs romp in a fantasy motif. Riding on snails, dancing and playing magical horns with a dragonfly prancing about. Deep embossed and recessed carvings. A Cream base with Forest Green and Burgundy background colors. Fabulous artwork, this is what I suppose would be a miniature Stien as it holds only 6 ozs. Beautiful vintage decor,as well as utilitarian art. 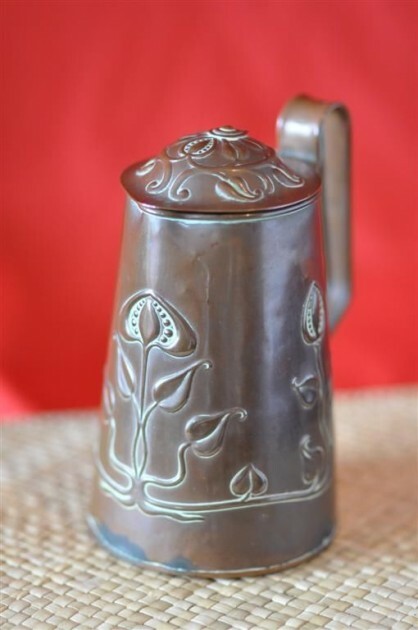 Measures 4 1/4″ H X 2 1/2″ W. Handle is 2 1/2″ L with a 1″ space beween the handle and stein. AS I COLLECT ALL SORTS OF METAL OBJECTS , NOT JUST BEER STEINS I WAS INTETREST IN SEEING THIS DESCRIPTION AS WELL AS THE NUMBER THREE  AD BELOW. EDITOR: You could have buried this piece in a load of manure in the early 1900’s and it wouldn’t be this dirty! and with the construction of the iron ring inside the lip indicates it is at least from the later 1700’s and certainly not Mission ! 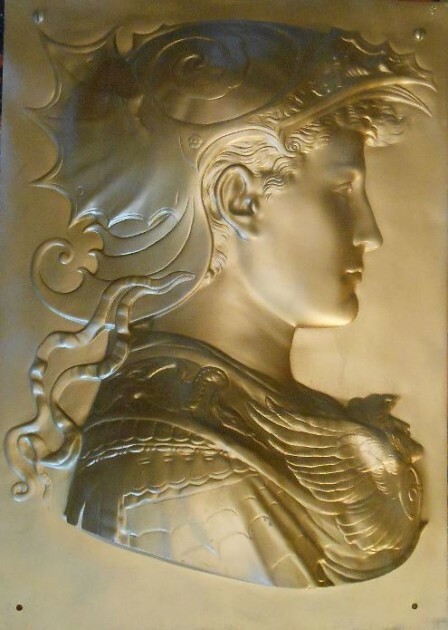 Editor’s note: This plaque certainly has the nicest set of male breasts I have ever seen …….. prior to today’s she-male implant operations !! Editor’s note: And here for all these years I thought one could see through glass!! Used as in; “A Vintage old German pottery stein” THE USE OF IT HERE AS AN ADJECTIVE IS WORTHLESS! “Vintage” must have a date / year or era indicator with it to have any meaning The word comes from the original usage with group of wines from the same year. and surprising, even to me “Vintage” won by a lot, with 8,034 hits , “rare” got 719 and unique got only 120.
and price was an outstanding $390.00 to start – PLUS SHIPPING OF COURSE !! 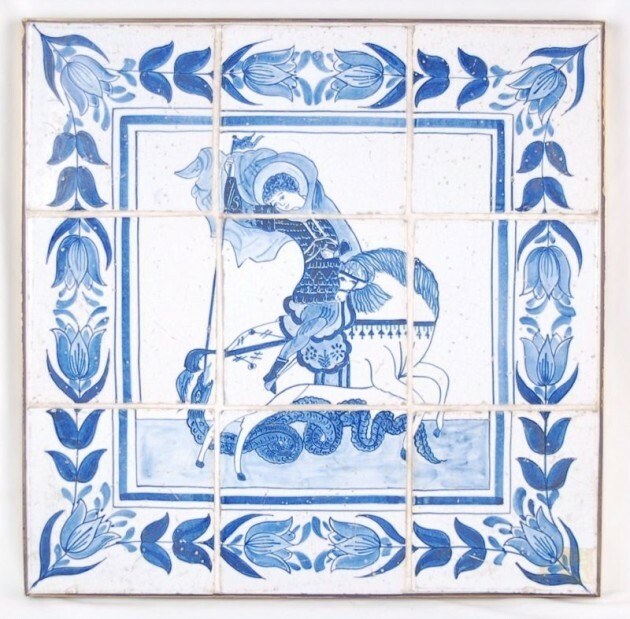 Delft hand painted tile picture depicting the biblical scene of Saint George slaying the Dragon. Would one of you religious scholars out there PLEASE tell me where this saint who died in the 4th century is written about in The Bible which was written (supposedly) about200 to 300 years earlier ??? 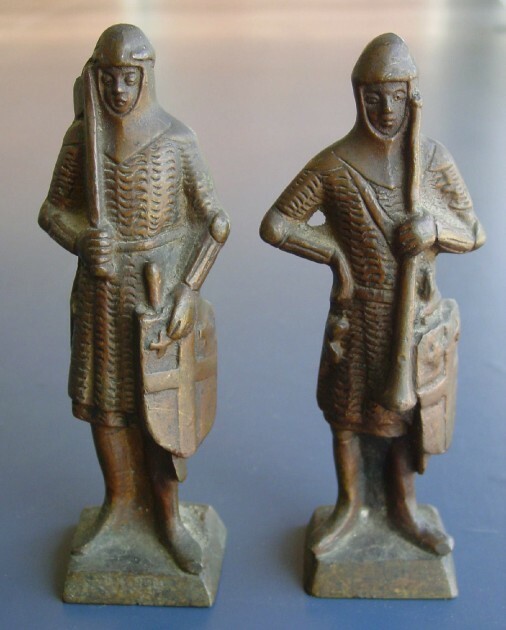 chess-men advertised as “Bishops!” (eBay Nov 2014!! The ebay seller called this ▲Gerz incised stein “carved” Well as in horse-shoes, hand-grenades and STD’s that’s pretty close!! 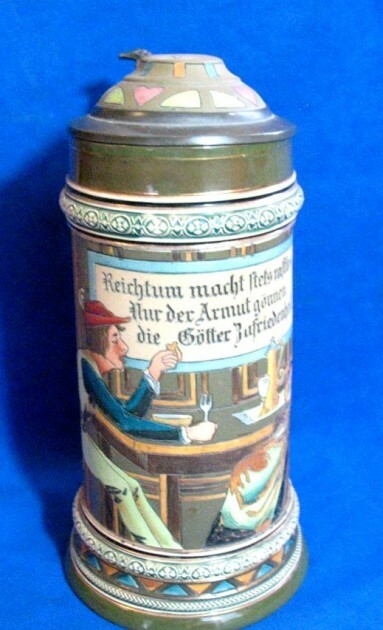 EBay -Dumb – Sxxx -ad said: German Beer Stein With Etched Silver Lid. 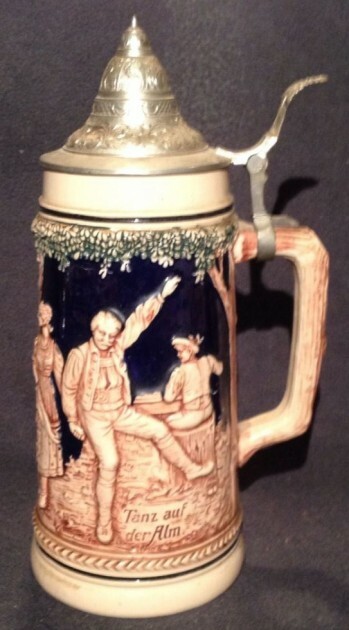 THE ONLY “HUNTING SCENE ON THIS STEIN IS THAT OF THE SON TRYING TO GET BACK A POSITION BACK IN HIS FAMILY WHEN HE RETURNS THIS IS THE BIBLICAL STORY OF THE PRODIGAL SON! !